Dr. David D. Burns, the renowned psychiatrist and author of the classic bestseller Feeling Good (which has sold more than four million copies), shares positive, proven strategies for fostering new levels of intimacy between couples, coworkers, friends, and relatives. We all know people who are hard to get along with. It might be your spouse, mother, neighbor, friend, or colleague. In his new book Feeling Good Together, Dr. David D. Burns describes Cognitive Interpersonal Therapy (CIT), a radically different method for developing more loving and satisfying relationships with the people you care about. 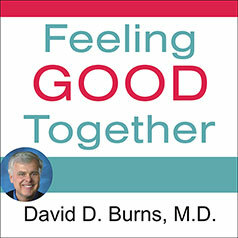 Based on twenty-five years of clinical experience and new, groundbreaking research involving more than 1,000 individuals, Feeling Good Together is filled with helpful examples and tools, such as the Relationship Satisfaction Test, the Blame Cost-Benefit Analysis, the Relationship Journal, Five Secrets of Effective Communication, the Intimacy Exercise, and more. Using these techniques, Dr. Burns shows you how to resolve virtually any kind of relationship conflict almost instantly. Author David D. Burns, M.D.